How can you not want to hug a tree? I have touched trees who knew Marie Antoinette, who saw Paris change from a smelly, muddy labyrinth of buildings; sewage gutted streets desecrating an ancient river, through revolution after revolution of culture, spirit, and blood, to the present city that glorifies all wealth, history human culture. The changes passed like a day in our time. Indians, a people who believed in the fundamental connection of man to living wood. Trees that were sent to a wild and young America from Europeans who prayed that our experiment in democracy, our experiment in belief of the intelligence of every man, would survive. I have seen trees in Massachusetts who took over and gently softened man’s first failed attempts to tame a country of wild forests. I touch these trees today, growing in fields of rock and ruin left by the settlers who moved on to better soil and to decimate other forests and vast stretches of prairie in search of abundant food and its resulting wealth and liberty. and wonderful stature. Trees who bear the burden of a civil war, a war to protect these freedoms and the unity of the ideal, as lightly as the moss that lends them a ghostly immortality in the darkest night. Even a lonely sugar maple in Normandy, growing outside of its comfort zone for a hundred years, patiently explains something to me of the role of the stranger, the interesting outsider who displays a truth in contrast with his surroundings and endures a solitary existence; teaching, ever teaching and reaching, ever reaching for the nourishment that tastes of home. short generations of humans cannot understand. And I say, how can you not want to hug a tree? I finally finished The Closing Of The Western Mind, by Charles Freeman. It was a bit of a struggle, mainly because Freeman discussed so many isms that I kept having to go back and sort them out, especially after he got to the Christian era. I’ve seen some very enthusiastic reviews of this book, and a few negative reviews, although most of the negative reviews seemed to be by conservative Christians, who I would expect might not view this book fondly. During the first 4-5 centuries of the Christian church, many of the theological debates were settled by Roman emperors interested more in keeping order than with any particular religious conviction. And Freeman presents Constantine, one of the early heroes of Christianity, as less Christian and more god-diverse than he’s been presented elsewhere. But it’s interesting to see how some of the accepted theological underpinnings of contemporary Christianity were subjects of such intense debate among early Christians. The birth of the Church was not as easy and uneventful as you might think. A logical follow-on to this book is one I read several years ago and enjoyed much more – A World Lit Only By Fire, by William Manchester. Where The Closing Of The Western Mind takes you to the beginning of the Dark Ages, A World Lit Only By Fire gives you Europe as it begins to come out. So if you read the first one, read the second one after it. You’ll feel better. Just turned off trackbacks completely. After deleting another 50 or so spam pings (I think I shall coin the term “sping” for these), I decided it wasn’t worth the effort, since the last legitimate trackback was a month ago. If I find a way to block spings, I’ll turn trackback back on. 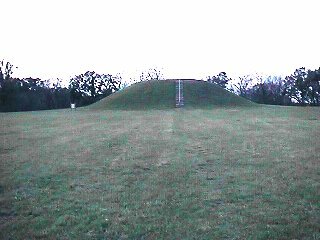 North of Natchez, just a few miles off he Natchez Trace in the southwest corner of Mississippi, is the second largest temple mound, and one of the largest Native American ceremonial mounds, in the country. It’s called Emerald Mound, and it was used by ancestors of the Natchez Indians. The mound is 35 feet high, and the broad flat top covers 8 acres, with a large secondary mound at one end and a smaller mound at the other end. The broad flat area was used for ceremonies and possibly games and feasts. The mound measures 770 feet by 435 feet at the base. I visited the site late on a winter afternoon several years ago. To give you a bit of scale, the white line in the center of the secondary mound in the distance is the hand rail of a double staircase. The top of the secondary is maybe 15 feet higher than the main mound. Archaeologists think a temple sat on top of the secondary mound. This picture was taken near the opposite end of the flattened top of the main mound. 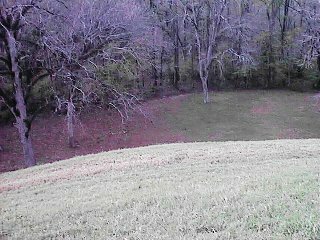 This picture was taken from the top of the secondary mound, looking down at the end of the primary mound. It’s about 50 feet to the ground below. 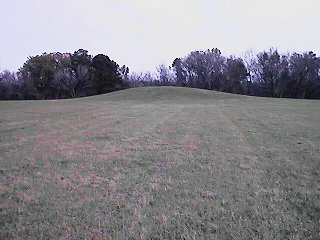 This picture shows the smaller mound, taken from the base of the secondary mound. It is believed the house of a priest was built on top of this small mound. This is probably not a book I would have picked up on my own. I love science, and science books, but my interests have always tended towards the physical sciences – astronomy, physics, meteorology, oceanography. The closest I’ve gotten to biology has been some chapters in one of Stephen Jay Gould’s books. (Considering I’m married to a high school biology teacher, this is maybe surprising). But my wife had to review this book for a class, and I started reading it. It’s the story of Gregor Mendel, the monk who developed the concept we now know as genetics by raising and crossing peas through several generations, and gave us the terminology of dominant and recessive characteristics. But it’s much more than that. It’s the story of a man who faced crushing disappointment and bounced back, not just once but several times, and died thinking he never made an impact on his world. One of the best books I’ve read in quite a while. Written by Robin Marantz Henig.